If prayer is intersubjective, if it takes place in a network of relationships, then who is being prayed with in my examples of unexpected places for prayer? Whose presence makes these spaces sacred to the people who pray in them? Ann Taves asks how anyone knows a supernatural figure is present, but I want to know who, exactly, is present. Is a Neopagan who makes offerings to a statue of the Virgin praying to Mary or to Gaia the earth goddess? 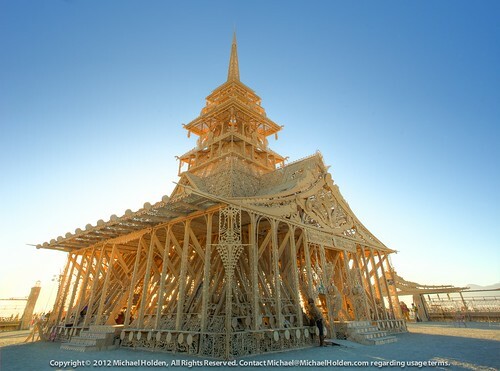 If the many “unchurched” Americans now identifying as “Nones” or “spiritual but not religious” have lost touch with the sacred others they grew up with, as many of them say they have, then who is there for them in new contexts like the Burning Man festival? During a collective mourning rite at Burning Man, an event I have been studying for over a decade, tens of thousands of participants, or “Burners,” send prayers to the darkened sky when they burn a temple for the dead (“the Temple”) on the last night of the festival. These prayers are not monologues, but constitute ongoing conversations with the dead, “Mother Earth,” “God,” the “Great Spirit,” and other unnamed heavenly and earthly powers. Throughout the week of the festival, tens of thousands of Burners bring mementos, handmade altars, collages and letters for dead friends and relatives, treaties to spirits of the earth, pleas for forgiveness and blessings, and lovingly lay them in the crevices or attach them to the walls of the Temple. There are no directions about how to pray at the Temple; no one tells Burners to whom they should pray when they cross its thresholds, many for the first time, throughout the days and nights of the festival. Some Burners locate themselves within religious traditions, but most do not. So how do they know what to do at the Temple? They know how to pray and mourn by watching and mimicking others and by drawing on childhood experience. They bring the emotions and memories of their inner histories with them, in mind and body, to a new ritual space that bears some resemblance to older familiar spaces. When they invent rituals, participants in New Age, Neopagan, and festival communities borrow from the religious idioms of the pasts they carry with them even when they have consciously left behind earlier religious identities. They pray as their parents, grandparents, neighbors, and friends—Jewish, Christian, Buddhist, Hindu—prayed, transposing remembered ritual attitudes into recently created rites. Through the lens of prayer we can observe that taking on new religious identities is a complex and fluid process rather than a simple replacement of the former self with a new self. As past meshes with present in embodied ritual experience, we glimpse and at least partially grasp how multiple religious identities and relationships with multifaceted sacred others are lived through practice.